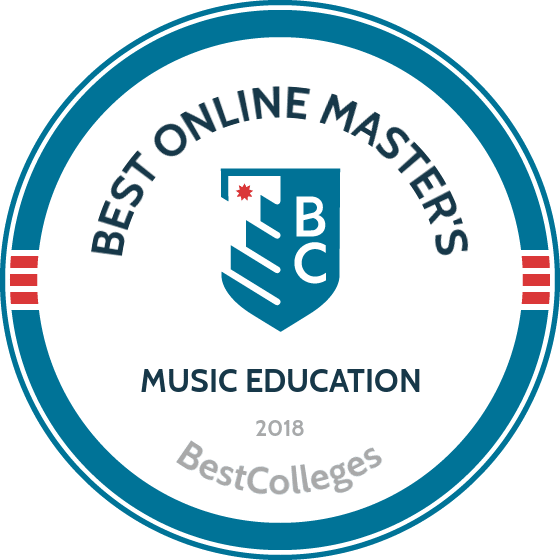 WHAT ARE THE BEST ONLINE MASTER'S IN MUSIC EDUCATION PROGRAMS? What Else can I Expect from an Online Master's in Music Education Program? An online music education degree is perfect for those who want to share their passion for music. Distance learners in master's in music education online programs gain practical experience developing lesson plans, exploring contemporary teaching methods, and implementing learning tools and techniques. Graduates teach general music classes in elementary, middle, and high schools, offer private lessons, lead music groups, and direct bands, choruses, and orchestras. According to the Bureau of Labor Statistics, the field of postsecondary teaching will grow 13% over the next seven years, making this a great time to earn a music education degree. The University of Florida's 33-credit program is offered 100% asynchronously online and can be completed in two years. Online learners should expect weekly assignments, discussion forums, video conferencing, and projects. The curriculum includes innovative courses such as instructional design, psychology of music, musics of the world, and technology-assisted musical learning. American vernacular music, a core class in the program, explores how jazz, rap, rock and roll, Latin music, and country music styles developed and their meaning in contemporary culture. Distance learners gain practical experience developing lesson plans, exploring contemporary teaching methods, and using the latest digital learning technologies. The primary focus of the program is on K–12 education but graduates may choose to apply their skills in other educational settings, such as adult lessons, private lessons, and community groups. Applicants do not have to submit GRE scores and should have a bachelor of arts, science, music, or music education and some professional teaching experience. Admitted students can begin in the fall, spring, or summer. The University of Georgia offers a master's of music education. The program is designed specifically for certified music teachers who want to enhance their research and pedagogical skills. Distance learners choose an emphasis in general, choral, or instrumental music. Upon graduation, students earn their Georgia teacher certification in music at the T-5 level. The 33-credit program can be completed in two years. Applicants must hold a bachelor’s degree in music education from an accredited institution. Additionally, applicants must have certification to teach in public or private K–12 schools, be eligible to receive certification, or demonstrate equivalent competencies. Incoming students can transfer a maximum of six credit hours into the program. Founded in 1872, Boston University has the oldest degree-granting music program in the United States. BU offers a 32-credit master of music in music education degree. With 12 credits of music education, four credits in music theory, and 16 credits of music-related electives, distance learners explore the latest research and analyze the philosophy, history, and psychology of music education. Students can choose from courses in music technology, community music perspectives, contemporary issues in music education, orchestration, and jazz and popular arrangements. They can also opt for a specialization in music technology, which leads to Level 1 certification through the Technology Institute for Music Educators. Courses are offered entirely online; however, students are invited to campus for an optional one or two week intensive course each summer. Students typically complete the program in 18–24 months. Colorado State University offers a 30-credit online master's in music education. The program focuses on Kodály music education, an approach that emphasises love of music and original expression before formal training. Kodály students learn to sing and read music before they play an instrument. At the end of the program, distance learners earn a Kodály certification. Designed for full-time working elementary, secondary, and independent music educators, the curriculum examines theory, research, philosophy, musicianship, and methods of music education. The program emphasizes the importance of sequential music curriculum, game literature, and the use of folk song and dance. Students must attend three two-week on-campus summer trainings in Fort Collins at the annual Colorado Kodály Institute. Applicants must hold a state-licensed music teaching certification and a bachelor’s degree in music from a regionally accredited institution. Home to one of the most advanced electronic music studios in the nation, the University of South Florida offers an online MA in music education. Students work in small groups and have autonomy over musical and creative decision-making. A peer mentoring program ensures students are always well-supported and are able to receive crucial feedback on their work. One key course is learner-centered approaches in music education, which focuses on original composition, problem solving, and peer groups. Distance learners are required to complete a one-week on-campus session. Distance learners also have the opportunity to complete a summer internship in London, England. This 30-credit online degree can be completed in one fall semester, one spring semester, and two summer semesters. Applicants must have at least two years of K–12 music teaching experience and are not required to audition or submit GRE scores. Established in 1876, the University of Northern Iowa offers a robust, cohort-based master of music in music education. Online learners participate in interactive video conferencing and group discussions via eLearning and Blackboard. Notable classes in the curriculum include developments and trends in music education, music history survey, research and writing in music, music learning and behavior, and analytical techniques. Students move through the classes in a set sequence, as each course builds on the previous one. With access to program coordinators and education, enrollment, and technical services, distance learners are actively supported at UNI. Admitted students must take a formative assessment called the Departmental Diagnostic Examination to identify strengths and weaknesses in music history and theory prior to enrolling in classes. UNK offers a rigorous, fully online 36-credit master’s of music education through the Department of Music & Performing Arts. The program seeks to meet the needs of all educators, including K–12 teachers, community college faculty, and individuals who wish to pursue a doctorate degree. Notable classes include advanced educational psychology, vocal pedagogy, aesthetics of music, music analysis, and workshops in instrumental and choral art. Students take a three-credit capstone course in which they complete a final research or performance project in a specialized area of interest. Online learners can expect to participate in interactive discussion forums, complete scheduled assignments, and have access to academic advisers and library services. Applicants must hold a bachelor's degree from an accredited institution with a major in music. Admitted students can begin in the fall, spring, or summer sessions. With a strong focus on research and analytical techniques, the master of music in music education at the University of North Carolina is designed for full-time working professionals. The program is cohort-based and students are expected to take all classes in their designated sequence. Specific courses include advanced conducting, performance studies, research methods in music, music for exceptional children, and measurement of music behavior. Students have the opportunity to take a summer course in masterpieces in music style. UNCG's online courses are more affordable than their face-to-face classroom courses and financial aid is available through loans, grants, and scholarships. Prospective students must complete the Departmental Diagnostic Examination in order to identify strengths and weaknesses in their grasp of music theory and history. This examination is not used in admissions decisions; instead, it is used to guide the student’s course of study. Interested applicants must hold a bachelor of music in music education or a related field. Admitted students can begin in the summer, fall, or spring semesters and can complete the program in one and a half or two years. Students who enroll in the master of music in music education program at East Carolina University have multiple areas of emphasis to choose from, including pedagogical studies, choral conducting, instrumental conducting, music therapy, Suzuki violin pedagogy, performance, and music theory and composition. Coursework is predominantly online. Prospective students should contact the advisor for their area of interest to determine if any courses must be taken in person. All specializations except for music therapy lead to a teacher license in North Carolina. The programs require 30–38 semester hours to graduate. In one notable class, the differences in human learning in schools, distance learners examine ethnicity, race, socioeconomic status, gender, and other cultural contexts in relation to schools and human learning. Students in all programs are required to complete a final capstone research report or thesis project. Applicants must hold an undergraduate degree in music education or equivalent and a valid teaching license. Incoming students can transfer up to six semester hours of previously earned graduate work at an accredited program in music. Located in Honolulu, Hawai‘i, the University of Hawai‘i at Mānoa offers a master of arts in music education that features two tracks. One track is designed for current teachers who hold a bachelor of education or comparable degree and is offered entirely online. The other track is designed for individuals who hold an undergraduate degree in music but do not yet have a teaching license or teaching experience. UH Mānoa's music education curriculum includes innovative classes such as music cultures of the world, music literature, history of rock and roll, psychology of music, and a seminar in music education and the internet. This master's program consists of 30 credits, including seven credits of general musicianship coursework, nine credits of music education, nine credits of music electives and required courses, and three credits of a master's project, in which students complete a final research paper or project and take a final written exam. Applicants must pass entrance examinations in music theory, sight-singing/aural skills, and music history. Florida International University offers a highly individualized and customizable 30-credit MS in music education with advanced coursework in music research, theories, and philosophy. Offered through the FIU School of Music, this cutting-edge online curriculum features classes such as psychological foundations of music behavior, curriculum and policy design, and analytical techniques. Online learners work closely with faculty to complete a final thesis or capstone project in a focus area of their choice. Designed for busy working professionals, FIU's flexible program allows students to start coursework in the fall, spring, or summer semester. The program can be completed in 18 months. New students must participate in an online orientation in order to acquaint themselves with the Blackboard learning platform. Applicants must hold an undergraduate degree in music from an accredited institution and submit a 20–30 minute video of classroom teaching. Qualified candidates will be invited for a face-to-face audition on campus at FIU. Graduate teaching assistantships are available for a limited number of students. The 30-credit online master's of music in music education at Rutgers is designed for current K–12 music teachers with teaching certifications. The curriculum examines the history and theory of music, with 18 credits of study in music education and 12 credits in music history, theory, and ethnomusicology. Classes include cognitive approaches to music learning, history of the western canon, and historical and philosophical foundations. Online learners must complete a final capstone project, a culmination of the research conducted over the course of the program. Rutgers' affordable online program offers low tuition for all students. Applicants must hold an undergraduate degree in music or music education from an accredited institution, have at least one year of teaching experience, and submit a 5–10-minute video of themselves teaching. With an emphasis on the application of music, advanced music techniques, and performance tools, the fully online MA in music education at Liberty University is designed to enhance students' understanding of music theory and strengthen their teaching skills. The program requires 39 credit hours to complete, including nine hours in foundational studies in music education, 18 hours in a music studies concentration, nine hours in music education studies, and three hours in research studies. Interested students can take courses in music in worship services. Online courses are delivered via Blackboard and are eight weeks long. Courses are taught asynchronously and there are no required login times during the week. Distance learners must complete a thesis, curriculum project, or lecture performance recital to graduate. They can also enroll in a five-day intensive course or a three-weekend format intensive course on campus in Lynchburg, VA. These on-campus courses are completely optional; if desired,all of the program can be completed online. Applicants must hold an accredited bachelor’s degree in music or a related field. With a generous transfer policy, Liberty will accept up to 50% of program hours from previously attended institutions. Southern Miss offers a flexible online master's in music education online program. Designed for passionate practicing music teachers and professionals, this program helps educators improve their teaching techniques. This 30-credit-hour program consists of 15 hours of required coursework and 15 hours of electives. Specific classes include music education curriculum development, student-centered curriculum, and education research and research designs. No thesis is required; however, students must complete comprehensive exams and two hours of ensembles. Students typically complete the program in a year and a half or two years. Graduate student advisors give each student individualized attention. Applicants must hold a bachelor’s of music education or its equivalent, have student-teaching experience, and hold a state teaching licensure. Admitted students can begin in the fall, spring, or summer semesters. Known for being an affordable institution, the University of West Georgia, offers an online master's of music in music education. This program teaches students how to create meaningful music education experiences for their students. Distance learners enroll in classes such as factors of musical learning, music history and literature, music theory, and research methods and materials. Classes are 14–15-weeks long. Students must complete an oral examination or a written thesis. Distance learning students may enroll in an optional face-to-face class. Applicants must hold an undergraduate degree in music education or a professional teacher certification in music. Incoming students may transfer a maximum of six previously earned credits. Buffalo State's MM in music education focuses on professional development. Upon completion, students can earn a New York State Professional Certification. Designed for music teachers who already hold initial teaching certificates, the 30-credit program consists of coursework in music history, theory, and education. Notable courses include social commentary in musical theatre and contemporary issues in music education. Students complete six elective credits in ensemble leadership, educational foundations, musical theater, or independent study. Applicants must hold a bachelor’s degree in music education from an accredited institution. Applicants are not required to have formal teaching experience, but it is preferred, and they are required to audition for admittance to the music department, either in person or through an online audition video. Applicants are automatically considered for music-related scholarships. Known as a pioneer in online and distance education, Kent State University offers an online music education master's degree. Designed exclusively for K–12 music teachers, this program aims to fine-tune teachers' abilities to shape the lives of their students through music. Distance learners can choose two of three concentrations in choral, instrumental, or general music. Courses include foundation of music education, technology for music teaching and learning, music research and analysis, and instruction in music theory, history, and ethnomusicology. This affordable program can be completed in 23 months. Applicants must have completed at least one year of teaching and an active US teaching license. Auditions and GRE scores are not required. Students may transfer a maximum of 12 credit hours. Adams State University’s master of arts in music education is an affordable two-year program that requires 30 credits of coursework. In this cohort-based degree, distance learners study with the same 20–25 students for the duration of the program. Through classes in analytical techniques, music education research, topics in jazz and rock, world music and culture, and music literature and pedagogy, graduates are well-prepared to enrich the lives of their students through music. Distance learners have two tracks to choose from: a predominantly online track that includes one three-day summer residency on campus in Alamosa, Colorado or a combined online/on-campus track. Applicants must hold a bachelor’s degree in music from an accredited institution or have a bachelor’s degree in a different subject and a state license in music. Admitted students may transfer a maximum of six previously earned graduate credits. Located in Aberdeen, South Dakota, Northern State University tailors its online master's of music education to students in rural areas who would otherwise be unable to take graduate-level classes. Designed for full-time working individuals, this program enhances student skills in choral, instrumental, and general music teaching. This practice-oriented degree consists of 14 courses and can be completed in two years. Classes include school of music administration, advanced rehearsal techniques, jazz pedagogy for the educator, music theory analysis, and technology for music educators. Students examine both Orff and Kodály teaching methods. Distance learners are required to attend a one-week intensive class each summer on campus. Tuition at Northern is affordable and online students are eligible for scholarships. Admitted students can begin the program in the fall, spring, or summer terms. Located in Richmond, Eastern Kentucky University offers a master of music in music education that blends professional and academic best practices. EKU’s engaging curriculum provides students with a personalized learning experience and specialized coursework in preK–12 music. The flexible 32-credit-hour program is made up of twelve hours of music literature, history, and theory, psychology and research, and ten hours of electives such as special topics in music and a instrumental music workshops. In order to graduate, students must complete an oral or written comprehensive exam but there is no thesis requirement. Courses run for eight weeks. This particular program does not lead to teacher certification. Applicants must schedule an audition and are encouraged to apply for merit scholarships. A maximum of ten hours can be transferred from previously attended institutions. Students pursuing a master's in music education online expand their musical knowledge and gain teaching skills. All online master's in music education programs include classes in music theory, history, and curriculum design, but some programs may emphasize areas such as Kodaly methods, choral music, or instrumental music. Historical and philosophical foundations of music education: This course explores the foundations of music, back to ancient Greece. Students examine the purpose of music education in an historical and contemporary context to define the reasoning behind instructional and curricular decisions. Research in music education: This course explores research proposals, criteria evaluation, data collection and interpretation, analysis presentation, and the application of findings to teaching practices. Students conduct interviews, develop scholarly writing skills, and examine literature, resources, and materials. Pedagogy and instructional design in music education: Students learn to develop, plan, design, implement, and evaluate music lessons and curricula. Coursework explores conceptual frameworks, learning theories, pedagogical approaches, learning tools, and assessment techniques. Psychology of music: Students explore the acoustics of music, human responses, hearing, and perception to understand how humans interact with music. This study of psychological principles and theories prepares graduates to meet the needs of individual students. How Long Does It Take To Get An Online Master's In Music Education? A typical online master's in music education requires 30 to 36 credits, which full-time students typically complete in 18 to 24 months. Completion time depends on the school and whether the student transfers in credits. Most programs allow students to apply some previously earned credits toward their degree, but some schools are stricter than others. Generally, students may bring up to six credits from previous studies, but some schools allow 10, 12, or even more credits. Some courses run for eight-week quarter sessions, while others last full semesters. Cohort-based programs require students to take coursework in a strict sequence, as each class builds on the previous one. Individually paced programs, however, offer customizable curricula and personalized scheduling. Accreditation shows that a school is committed to academic excellence through a comprehensive review process. Online music education degree programs may be regionally and/or institutionally accredited. Six U.S. agencies award regional accreditation to schools that meet rigorous standards. On the other hand, institutional accreditation applies to a department or program, and institutional accrediting bodies focus on a particular area of study. Music majors should look for accreditation from the National Association of Schools of Music (NASM). Established in 1924, NASM comprises more than 600 accredited conservatories, schools, universities, and colleges. The U.S. Department of Education (ED) establishes federal financial aid policies, conducts research on schools, identifies and addresses education-related issues, and ensures equal access to education. While ED does not accredit educational institutions or programs, the department recognizes and approves accrediting agencies. ED promotes the accreditation of institutions and ensures steady improvement of academic quality. The Council for Higher Education Accreditation is a leading advocacy membership organization made of up more than 3,000 colleges, universities, and accrediting agencies. ED and CHEA each maintain a list of recognized accrediting agencies. Graduates with an online music education master's degree pursue careers in academic leadership, curriculum design and research, and teaching. Graduates share their passion for music by directing bands, choruses, and orchestras, leading community outreach groups, and conducting private lessons. Some music professionals teach university classes, lead professional workshops and conferences, and publish research. Music directors lead music groups such as orchestras, bands, and choirs. Thy balance the music's melody, timing, volume, and rhythm by providing feedback to musicians. They also select compositions and arrangements for performances. Elementary school music teachers share musical knowledge with young children. They create lesson plans, develop classroom rules, communicate with parents, and observe and assess the musical abilities of their students. Middle and high school music teachers build on the foundational musical knowledge students learned in elementary school, while high school teachers prepare students for life after high school. Postsecondary music faculty may work as adjunct or full-time professors at colleges or universities. They create instructional plans, advise students, conduct research, and sometimes serve on academic or administrative committees. Musicians perform for live audiences and participate in musical recordings with bands, orchestras, or other music groups. Many professional musicians give private lessons to adults and children. In addition to career and workplace, professional experience impacts annual earnings for music education professionals. The expected salaries of elementary, middle, and high school teachers increase with experience. On the other hand, online music education degree holders who become music directors typically receive a relatively consistent income throughout their careers. The following table shows median salaries for popular positions for graduates of master's in music education online programs. After enrolling in a master's in music education online program, complete the Free Application for Federal Student Aid (FAFSA) to determine which federal aid you are eligible for. Find out what opportunities your school offers, such as loans, grants, work-study programs, and need-based scholarships. Music-related merit-based scholarships are available through professional music organizations such as NAfME, ASCAP Foundation, and National Federation of Music Clubs.